the scan doesn't look good so i decided to vector it. took me about five days to vector, and one day for the bg. Very good wall! You did an excellent job on the vector, and the background is very well done. Great scan choice as well. I like the joyful feeling of the wall, one of those images that makes me smile... hehe. Nice work ont he clouds and house too. A simple looking but very good wall I would say. There isn't one problem I can spot, so Excellent work! It is simple and very good! You choose nice scans for it. Good work! Thanks for sharing. Great work!!! 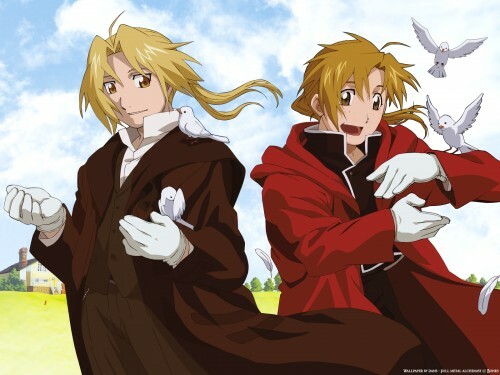 XD Ed and Al look so nice here!!! I love this scan!! XD - excellent vector!! It's a simple background and it's ok cause the two of them take a lot of place on the wall. The sky looks great, nice job with the clouds. I'm wondering how you did the house... is it the one in the anime? Oh and I finally figured out who the guy is in your avatar. XD Yay for Black Cat! Amazing job on vectoring really. And I love the scan you used. I love their smiles. The background is also nice. It' hard to see their smile...but you really did it. Awwww................... Kawaii!!!!!!!!!! >d>d>d>d I love this wall!!!! I've been waiting for someone to vector this scan, and this is just XD . It's beautiful. The scan looks really nice, and the background does too. You got a nice wallpaper here but Edward's mouth looks toothless and odd. a vector... >_< no waay..